The time may have come to take profits or even to consider shorting soybeans as persistently high futures prices created by the 2012/13 drought have caused producers to increase production to record levels. The June World Agricultural Supply Demand Estimates Report issued by the USDA estimates that producers will plant 81.5 million acres of soybeans in the US and that those acres will produce 98.9 million metric tons of the oil seed. If realized, both would set US records. For investors in soybeans, whether via futures, options, or the Teucrium Soybean Fund, in my opinion the time has come to take profits or even to consider shorting the oil seed as persistently high futures prices created by the 2012/13 drought have caused producers to increase production to record levels. In contrast, for companies that buy soybeans for further processing into oil and meal like Archer Daniels Midland (NYSE:ADM), higher supplies and falling prices mean greater profitability in both their oil seed processing and agricultural services businesses. Moving further down the value chain, Pinnacle Foods (NYSE:PF) uses soy oil to produce many processed food products. 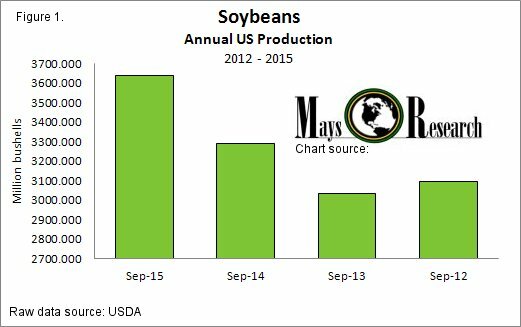 Producers grow soybeans mostly for oil production, and soy meal is what remains. Livestock producers use soy meal as animal feed for chicken, pigs, and even farm-raised catfish. During its first-quarter conference call, Archer Daniels Midland reported strong soybean crushing volumes in its oil seed processing business. This has likely continued into the company's second quarter as the USDA raised its current marketing year soybean crush estimates by 5 million bushels due to strong soybean meal exports. The crushing process separates the oil from the bean. A large soybean harvest will also benefit the company's agricultural services business. High crop production tends to encourage farmer selling and add to income from storage carry. This year's expected large harvest, if realized, will certainly do that. While Pinnacle Foods did not mention soy oil directly during its first-quarter conference call, it did state generally that it uses forward contracts to fix the price of soy oil, as well as corn, wheat, and other input costs. 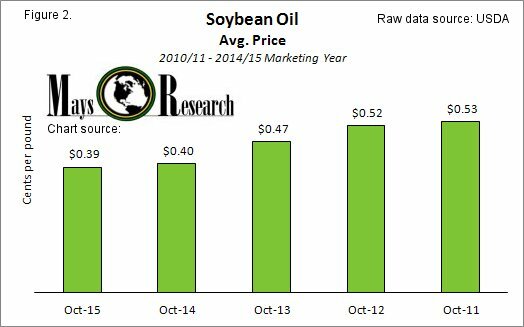 While there was no change in the $0.39 per pound estimate of soybean oil prices from May, after peaking at an average of $0.53 per pound during the 2010/11 marketing year average prices have declined by about 25%. 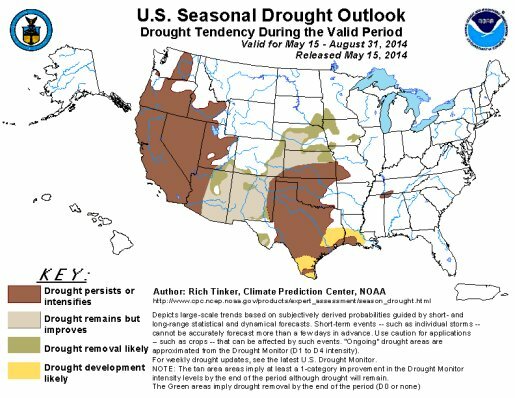 Risks to the bearish thesis for soybeans include hot and dry weather during the crop's key pollination period. Another risk is a significant reduction in the estimate of confirmed soybean acres planted when the USDA releases its acreage report on June 30, 2014. As of this writing, the latest projections from the National Weather Service's climate prediction center expect favorable growing conditions through the end of August. With 74% of this year's soybean crop rated in good-to-excellent condition through June 8 the crop is off to a superb start. However, it's still very early in the growing season and an adverse change in weather conditions could affect the physical area harvested as well as the yield. In terms of area, since 1981 producers have harvested an average of 98% of planted acreage, with a low of 91.6% in the 1997 growing season. In the 2014/15 marketing year, producers will harvest an estimated 99.2% of acres planted, which would be the highest percentage in the last 34 years. On Friday, June 13, 2014, November soybean futures closed at $12.12 per bushel while the thinly traded Teucrium Soybean Fund ETF closed at $25.39 per share. If producers do in fact harvest a record soybean crop, the lower soybean prices will effectively transfer a percentage of the profits from crop producers downstream to food processors like Archer Daniels Midland and Pinnacle Foods. This is a classic case of not earning or losing profits but of profits simply changing hands.